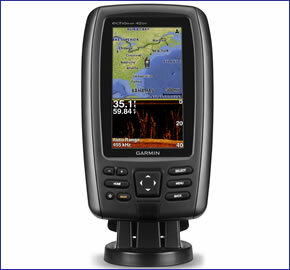 Garmin echoMAP 45dv is a Chartplotter and Fishfinder with a 4.3-inch, colour, automatic backlight adjustable display. It comes preloaded with mapping for UK, Ireland and North West mainland Europe and you can add additional BlueChart g2 or g2 Vision maps to this Garmin Device. The internal GPS antenna updates your location and heading 5 times per second meaning you get a fluid display of where you are and your direction. 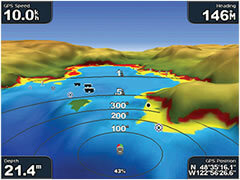 Plus the echoMAP features DownVu which provides a sonar view below the water. It is waterproof to IPX7 standards. Please note: For the Sonar to work you will have to separately buy a transducer. Garmin echoMAP 45dv has been discontinued. Accessories, spares and parts are still available for the Garmin echoMAP 45dv, as are marine BlueCharts. The echoMAP 45dv has been replaced by the echoMAP CHIRP 45cv. For the latest range of marine chartplotters click here. DELIVERY: Please note: These items weigh in excess of 2Kg and may attract a higher delivery charge. Royal Mail 1pm, 9am, Saturday delivery and International Signed For may not be available with this product. At our option we may use a courier and delivery could take two days or more. If you require urgent delivery please e-mail before placing your order. The echoMAP 45dv is a Garmin Chartplotter and Fishfinder which features a 4.3-inch high-contrast display with automatic backlight adjustment, tilting for operability and keypad control for easy use. Preloaded to the echoMAP device are UK, Ireland and North West mainland Europe coast maps. The Garmin 45dv will always update your position on the map display using the built-in 5Hz Internal GPS; In fact it updates your position and heading 5 times every second resulting in a fluid display of your route taken. The echoMap is compatible with transducers that use both 77/200 kHz HD-ID and Garmin DownVu. You willl need to buy a Garmin Transducer for the Sonar to operate. The Garmin echoMAP 45dv will display views under the water using the built-in Sonar which provides 500 W (RMS) HD-ID/4,000 peak-to-peak. The displayed images provide a view below the water, below your boat which has been named by Garmin as DownVu. DownVu will show photographic images below the boat. The display will show structures below the water, submerged objects and fish. For the Sonar to work you will need to separately buy a transducer. With the echoMAP 45dv you can also record sonar images for playback on a computer using HomePort planning software. To find the perfect transducer to partner your echoMap 45dv and your boat please complete our online form here. Pictured below, transom mounted transducer, thru-hull transducer and in-hull transducer. If you would like an echoMAP chartplotter with a larger screen we recommend that you buy the Garmin echoMAP 55dv which features a 5-inch screen instead. The echoMAP 45dv come as standard with Garmin g2 BlueCharts for the waters around the whole of UK, Ireland and North West mainland Europe. Additional Bluecharts e.g. France, Iberia are also available on SD/microSD Card. The very best charts are BlueChart g2 Vision SD cards. These premium charts include: MarinerEye - keep an eye on 3D information above the waterline, FishEye - provides 3D information below the waterline. Furthermore high-resolution aerial images help you to identify where you should be traveling when you are unfamiliar with the layout of the waterways. There is an Auto Guidance feature that provides a route you can follow which avoids shallow water, buoys and other obstacles. You can save up to 5,000 waypoints and 100 routes to your Chartplotters' memory. Alternatively you can transfer waypoints and routes between Garmin devices using the supplied User Data Sharing Cable. The echoMAP 45dv is waterproof to IPX7 standards and will also record water temperature in a log and graph. ‣Cleaner installation thanks to power plug which plugs into the mount making installing and removing the echoMAP quick and simple. ‣Sonar recording. Playback using HomePort Software. Flush and Bail mounting options enable you to mount the echoMAP 45dv device against most flat surfaces in your boat. Installing and removing the echoMAP 45dv is now also very quick and simple. The power plug connects into the mount not the device making the installation and removal a quick process. So when you are not in your boat you can simply and quickly remove your Garmin echoMAP Chartplotter. Likewise when you are using your boat you can efficiently connect the Chartplotter to your mount. Garmin echoMAP 45dv marine chartplotters are preloaded with Garmin BlueChart g2 UK and Ireland mapping (pictured right). The chart features detailed marine cartography coverage of the British Isles in their entirety, including the Thames Estuary, Caledonian Canal, Outer Hebrides, Shetland and Orkney Islands, Isle of Wight, Isle of Man, and the Irish Sea. Coverage across the English Channel from Douarnenez, France to Emden, Germany, including the Channel Islands, and the Seine River to Rouen, France Detailed coverage includes Antwerp, Belgium, Rotterdam, Netherlands, Amsterdam, Netherlands, and the Ijsselmeer in full. For more information about Garmin marine Bluecharts click here. In future years you can purchase a marine map update SD card to update the preloaded UK and Ireland charts on the Garmin echoMAP 45dv. Looking for Garmin echoMAP 45dv accessories? Accessories available to purchase include 4-inch protective cover, flush mount kit and tilt and swivel mount. If you'd like to add a transducer to your echoMAP 45dv please see this page. Add Garmin BlueChart g2 HD and g2 Vision HD marine charts to your Garmin echoMAP 45dv, view the different charts you can buy from ActiveGPS here. ‣Basemap: None. Preloaded with Maps of UK and Ireland g2 map.